With Thai cuisine being reason to travel from all corners of the globe to Bangkok, it seems like a good idea to pick up some of their wonderful pearls of wisdom and culinary secrets whilst visiting, or living, in the foodie city. With creamy curries, delectable fish cakes and exquisite noodle broths, Thailand is a country that certainly knows its good cuisine. 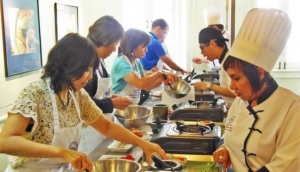 Whether you're paying a fleeting visit to the capital or you're an expat, cookery classes can help you perfect some wonderful Thai dishes.